Little Rock, Arkansas – September 2014 – Pinnacle Hotel Group principles attended the Arkansas Hospitality Association Banquet held at the Clinton Presidential Library on September 17, 2014. Chet Patel, President of PHG was nominated as the Treasurer for the Arkansas Hospitality Association Board for 2015. He will serve this position beginning January 1, 2015 working directly with the AHA office. Nick Nagin also serves as a AHA Board member whose term will expire 2018. 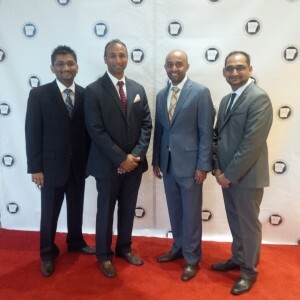 (left to right) Chet Patel, Rocky Govind, Shawn Govind, Nick Nagin at the Arkansas Hospitality Association Banquet at Clinton Library Sept 2014.